For 2012, the FUEL reintroduces one of our most important design features — Splitstrut Technology. The 2012 FUEL is built on a 5 strut platform, making the kite incredibly rigid and stable in even the toughest conditions. This year we’ve also incorporated new trailing edge construction for extra protection to decrease wear. Other innovations such as One-Pump (original Slingshot patented single point inflation system), Custom Fuel Injection (fine tune for wake or freestyle) and Progressive Power Steering (optimum tracking, precision feedback, custom range) continue to lead the industry. The combination of this dedication, design and technology create a kite with unmatched deliberate power, fearless looping and unwavering recovery — making the FUEL the C kite expert rider’s weapon of choice. 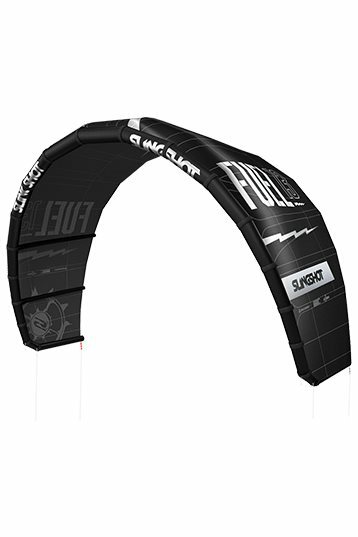 The Slingshot Fuel kite is the most durable and smooth working C-kite on the market. Not everybody is ready to ride a C-kite but kiteboarders with a bit of experience would fall in love with this kite. The difference between a Bow/Hybrid kite and a C-kite is comparable to riding an automatic or manual car. If you want to improve and ride as hard as you can, a c-shape will probably be your choice. The Slingshot Fuel has been designed to give optimal stability, smooth power throughout the whole window, a direct feel and response for precise movements and it is build to last. I have been riding the Fuel for over a decade and helped develop the kite to what it is today... Once a Fuel rider, always a Fuel rider! :-) Unmatched performance and the best kite for kiteloops.